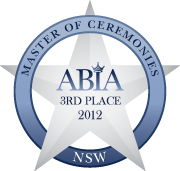 This year I was extremely proud to have been an Australian Bridal Industry Academy (ABIA) Finalist once again in all three categories in which I provide services; Disc Jockey, Master of Ceremonies and Ceremony Music, at the Annual Bridal Industry Awards. I do like to attend the Awards night as it allows the opportunity to support and meet other industry professionals I may not have had the good fortune to work with and to celebrate in all the successes. It is not about winning, for if you are a Finalist, I believe, you are in the top tier of the wedding industry, as rated by those most qualified to do so – the actual brides and grooms and as such, every supplier in the room is already a winner. This year, due to a booking, confirmed in the earlier part of the year for a wedding on Fraser Island, Queensland and the Awards being held on what was arguably the most popular day for weddings in the entire year (12.12.12), I was unfortunately unable to attend the Awards Night. You cannot imagine my excitement when I found out that DJ:Plus! Entertainment had been awarded the ABIA for “Best Wedding DJ” 2012 with a rating of 99.98%, placed in the Top 3 for Master of Ceremonies and the only DJ to be a Finalist in the Ceremony Music Category!!! My couples know that I do not do what I do to win Awards. They know that I am very passionate about what I do and making their dream wedding better than they imagined it could be, is my highest priority. I thank all of them from the bottom of my heart for the trust that they afford me. I thank them for opening their hearts and sharing each unique and beautiful love story. I thank them for the connection and inviting me to be a part of one of the most significant events in their entire life – it is truly a great honour and privilege. I cannot thank them enough for allowing me to ‘feed my addiction’ of love and happiness and I also wish to express my gratitude for their feedback and votes. My couples challenge me, motivate me, inspire me and drive me to continually improve what and how I do things – in short it is best summarised by the title of a popular wedding song by Bryan Adams, Everything I Do, I Do It For You.